For over 40 years, family-owned and operated Rustic Fence, Inc. has provided a complete range of residential and commercial fence products and installation to clients in the communities throughout Maryland, including Howard County, Montgomery County, Frederick County, Carroll County and Baltimore County. We offer a variety of fencing styles to compliment your home or business. And you’ll speak directly with the owner — no pushy salespeople or middlemen! Our motto is “Our customers are the best recommendation” and are proud to say that our largest sources of advertising are our repeat customers and positive referrals. And we guarantee you’ll be 100% satisfied with our services. Our owners are available for their customers to discuss their custom fencing and fencing installation needs. Whether it’s a split rail fence, athletic field fence, sport court, fencing for commercial properties or a custom designed ornamental fence for your pool area, we’re here to provide quality customer support and service. 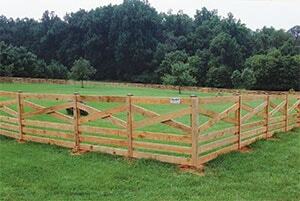 Wood fences are a very common enclosure solution and can be very stylish while cost efficient. Increasingly popular now because of their durability, clean look and low maintenance, we offer a multitude of vinyl fence options – be sure to contact us for our full line of offerings. Chain link fencing remains popular among commercial and residential customers. Having a chain link fence installed around your property is one of the easiest and most cost-effective means of providing added security. With an aluminum fence, you can achieve the look of a wrought-iron fence and stay within your budget. Aluminum is durable, lightweight, low-maintenance and will last for years to give your property a distinguished look. When it comes to meshing functionality with style, nothing beats an ornamental fence. We offer a wide variety of styles and types of ornamental fence to meet your residential or commercial needs. From agricultural fences to automatic gates, Rustic Fence can assist you with expert design recommendations and quality installation. We offer a variety of enclosure solutions so be sure to contact us for any custom job you may be thinking of for your home or business.